Robometricschool. - There are many robot that design to surveillance in military field. One of the robot that design to scout of enemy is Sand Flea robot. Sand Flea robot designed to compatible for task in military and policy or rescue and can solve the hurdle. Sand Flea robot designed can jump from with high or long jumping. with this characteristic Sand Flea can be used to scout the enemy in war field from far distance. In war, know more information about enemy in very important, when it is do by human it will be dangerous. So robot can use to do this job. Sand Flea develop by Boston Dynamic, United state to help military. Boston Dynamic in introducing Sand Flea robot, hopes that Sand Flea robot can be an alternative to help the American soldiers lurking and also get information about the enemy. Because it is used in the world wars, modern surveillance robot, named Sand Flea has a lot of ability. 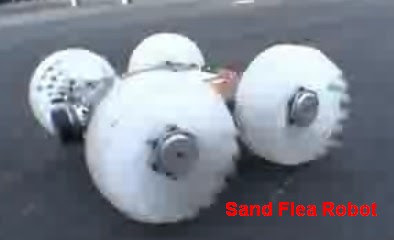 Sand Flea robot having ability like able to jump at a height of 10 meters and landed safely. This is because the Sand Flea uses the stability system to keep himself steady when just high enough to make the leap. Although Sand Flea robot design with simple form, but this robot completed with on-board video system that is capable of displaying visual data remotely. Robot with weight 4.9 kg and long 33 cm also can keeping the U.S. troops to remain in a safe range while getting important information from the enemy.